Rest in Peace Sir. I had the honor to meet and speak with him on several occasions. He was a true hero and always available to talk to. Retired Lt. Col. Richard "****" Cole, the last veteran of the famous "Doolittle Raid" on Tokyo during World War II, died Tuesday. He was 103. Air Force Chief of Staff Gen. David Goldfein announced Tuesday during the Space Symposium in Colorado that Cole had died at Texas' San Antonio Medical Center. Goldfein had visited Cole at the hospital earlier this week, he said. "There's another hole in our formation," he told the audience Tuesday. 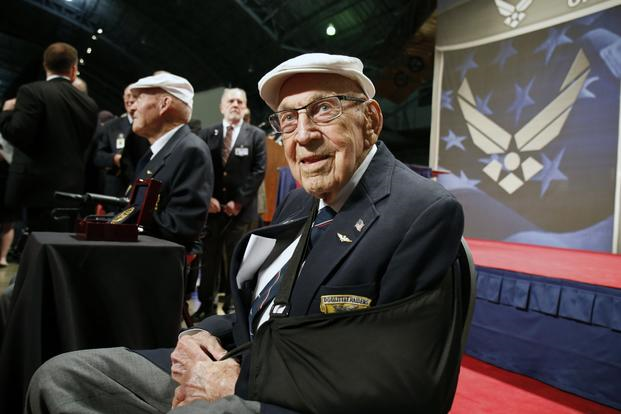 "Our last remaining Doolittle Raider has slipped the surly bonds of Earth. He is now reunited with his fellow Raiders. And what a reunion they must be having." The famed raid was named for then-Lt. Col. James "Jimmy" Doolittle, who led 16 B-25 bombers and 80 crew members from the aircraft carrier Hornet in the western Pacific on a strike targeting factories and military installations in and around Tokyo on April 18, 1942. The mission helped boost morale after the attack on Pearl Harbor. Cole, Doolittle's co-pilot on the mission, received the Distinguished Flying Cross for his role in the bombing. "Those 80 intrepid airmen changed the course of history," Goldfein said. "They executed a one-way mission without hesitation against enormous odds." Cole spoke to Military.com about the raid in 2016. "The flight was designed to do two things: One, to let the Japanese people know that they could be struck by air; and the other thing was the morale, and we did that, so we were very proud of that," he told Military.com. In 2014, then-President Barack Obama signed legislation awarding the Congressional Gold Medal, the nation's highest honor for distinguished achievements, to the Doolittle Raiders. Cole, who stood beside Obama during the signing, said he wished his fellow pilots could have been there to see the historic day. "I wish all of the Raiders were here to take part in the bill passing," he said in an interview with Air Force Times at the time. "I couldn't be happier." A year later, the medal was presented at the U.S. Capitol; it is now at the National Museum of the Air Force in Dayton, Ohio. On the 75th anniversary of the raid in 2017, veterans and leaders from across the U.S. honored the Raiders with a ceremony and a B-25 and B-1B Lancer flyover followed by a toast at the museum. On Tuesday, Goldfein recalled that ceremony. He said he asked Cole what it felt like to be "'flying blind for so many hours, low on gas, after they hit their targets, trying to make it to the Chinese coastline without a beacon to guide them." Cole, he said, joked it would have been nice to have had GPS back then. "We're going to miss Col. Cole, and we offer our eternal thanks and our condolences to his family," Goldfein said. "The legacy of the Doolittle Raiders will forever live in the hearts and minds of airmen long after we've all departed." The Raiders' achievements have been celebrated many times over the years. In 2017, President Donald Trump spoke with Cole during a phone call in advance of his 102nd birthday. The Air Force in 2016 named its next-generation B-21 Long Range Strike Bomber the Raider after the Doolittle Raiders, which Cole announced for the service.